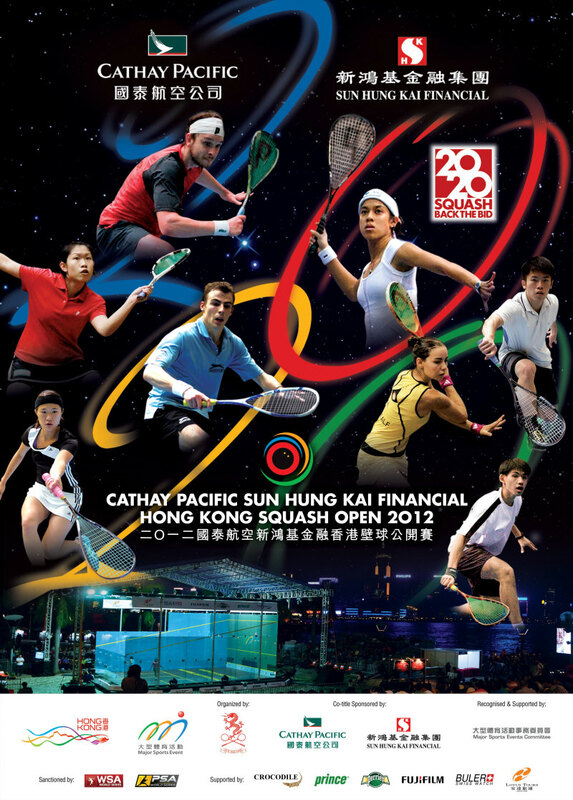 The annual squash extravaganza Cathay Pacific Sun Hung Kai Financial Hong Kong Squash Open 2012 will take place at Hong Kong Squash Centre and Cultural Centre from November 25 to December 2. The world’s top 30 players from the Women’s Squash Association (WSA) and the Professional Squash Association (PSA) will once again vie for a lucrative winning purse of HK$1.6 million in the world’s most vibrant city. This year, the ever-popular Hong Kong Open has also been chosen as the inspection event for the International Olympic Committee (IOC) to determine which of the sports shortlisted should claim a place on the programme for the 2020 Olympiad. As a centrepiece in the World Squash Federation’s bid for Olympic inclusion, Hong Kong Open, having been recognised as one of the favourite and best-organised events, would showcase the best of the sport to impress the IOC delegation. "Hong Kong Squash is very proud to hold the Hong Kong Open for the 27th time with the support of Cathay Pacific, Sun Hung Kai Financial and all other co-sponsors” said Mr David Mui, MH, JP, Chairman of Hong Kong Squash. "It also is an honour for us to have the opportunity to present the tournament, and the sport, in its best possible light to IOC delegation to ensure that squash gets the chance we all feel it deserves to become part of the Olympic programme." "We are very happy that the IOC selected Hong Kong for the squash leg of its inspection tour,” said Mrs. Heather Deayton, WSF Vice President. 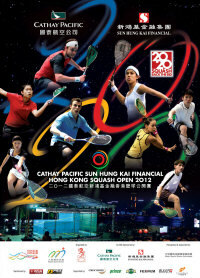 "We are very confident that they will enjoy Hong Kong, and that they will see another great year of the Hong Kong Open. “Bringing the sport to the next level, we are also delighted to appoint Dr York Chow to be the first 'WSF Ambassador for Squash',” added Mrs. Deayton. "Dr Chow besides is a keen squash player, who also has been very supportive. We believe that his strong sports background and his passion for squash will help promoting the sport in the international arena." The early stages of the tournament will be held at the Squash Centre before moving to the Cultural Centre in Tsim Sha Tsui for its semi-finals and finals. For the women’s event, which has just been drawn at the press conference, Nicol David of Malaysia, the six-time world champion is the top seed of the women’s event, and will meet Sarah Kippax from England. Our local number one Annie Au Wing-chi who has reached her career high of 6 in the world ranking, together with HK’s Joey Chan Ho-ling will face qualifiers, while the rising star Liu Tsz-ling who enters the main draw via the wild-card will meet Dipika Pallikal from India. James Willstrop, the world number one and defending champion, is the top seed of the men’s event. He will face his compatriot Adrian Grant, who currently ranks 19, in the first round. Our local hero Leo Au who recently won his first Hong Kong Champion title, is for the first time straight into the main draw via the wild-card spot. He will meet the fourth seed Karim Darwish from Egypt. Back row from the left, Mrs. Heather Deayton, Vice-President, World Squash Federation, Miss Carat Cheung, Miss Hong Kong 2012 & Miss International Goodwill 2012, Mr. Terry Smith, Vice Chairman, Major Sports Events Committee, Mr. Simon Large, General Manager Marketing, Loyalty Programmes & CRM, Cathay Pacific Airways Limited, Mr. David Mui, MH JP, Chairman, Hong Kong Squash, Mr. William Leung Wing-Cheung, BBS JP, Executive Director, Chief Executive Officer of Sun Hung Kai Financial Limited,Mr. Jonathan McKinley, JP, Deputy Secretary (Recreation & Sport), Home Affairs Bureau, Dr. York Chow, GBS and Miss Jacqueline Wong, Miss Hong Kong 2012 First Runner-Up 2012. From the left of front row, Hong Kong players, Mr. Max Lee, Ms. Annie Au and Mr. Leo Au.